The crisis rocking the Peoples Democratic Party (PDP) over the outcome of the party’s primary election and the emergence of Senator Ademola Adeleke as its candidate for the September 22 governorship election seems not to have abated yet as some aggrieved members of the party have filed another suit before an Osun State High Court against Adeleke’s candidature. The fresh suit, with number HOS/M.119/2018, was filed by Oyetunji Suredi and Olagboye Adedamola who are seeking an interlocutory injunction restraining Adeleke from parading himself as the candidate of the PDP in the coming Osun governorship polls over the issue of his school certificates. 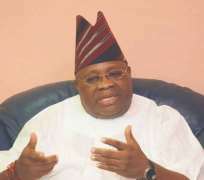 They also sought an order of the court to restrain the Chairman of Osun PDP, Soji Adagunodo, and the Independent National Electoral Commission (INEC) from further recognising Adeleke as the candidate of the party.